What drives us much more than brides saying "yes" to their dress is the fact that brides will be saying "I do" to the love of their life. And, as they do that, every bride should be able to wear the dress that expresses them most beautifully. I purchased Celestial Selections in 2014. 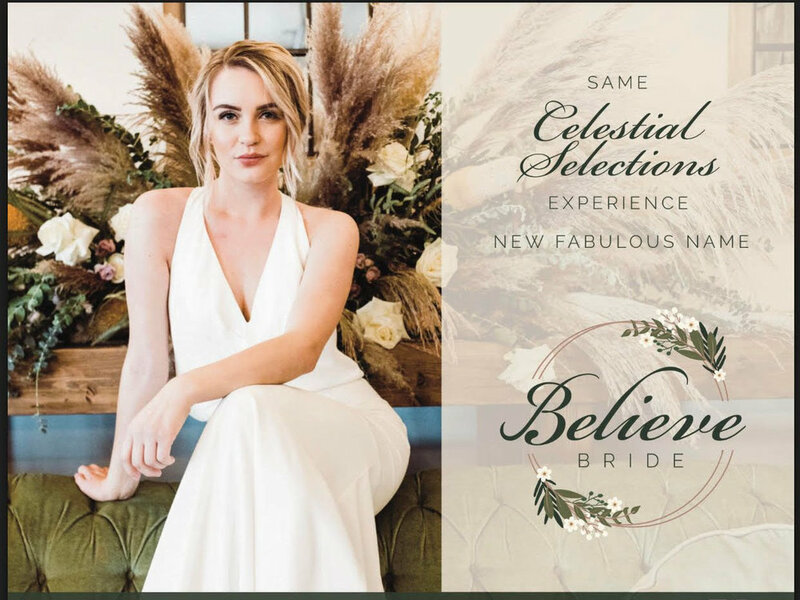 Since then, our amazing team has seen our boutique become the premier bridal shop in the Northwest, and as we move forward as Believe Bride, our promise to all our brides is that what we believe will continue to inspire exceptional experiences for all who visit us. Come see us soon -- step inside and experience the difference for yourself! What Does This Mean for Amazing Brides? All good things! We are still the same people under the same ownership, giving our brides the same incredible experiences! If you have already bought your dress from us, no worries! All orders will continue with no interruptions. We have transitioned all of our social media platforms to reflect our new name, so be sure to check them out! Our address and phone numbers have not changed! Can't wait to see all of our Believe Brides! If you have any questions at all, please don't hesitate to call. We look forward to continuing to serve all our brides -- past, present, and future! Being a Believe Prom Babe. See some of our favorite prom and formal dresses here at Believe and get inspired! Then come visit us to shop for your prom or formal gown here in Spokane, WA.